Each year the McLean Institute hosts the Celebration of Service to honor exemplary servant leaders. The premier award given at this Celebration is the Algernon Sydney Sullivan Foundation Award, which is given to one community member and student each year to recognize their humble service to the broader community. Learn more about the Sullivan Award and its past recipients here. 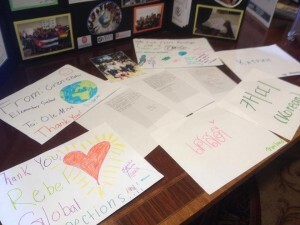 Letters from Crenshaw Elementary School students on display at Rebel Global Connections’ presentation at the Service-Learning Symposium. To learn more about the Celebration of Service or to share other ideas about community engagement work at the University of Mississippi, contact Dr. Albert Nylander. The McLean Institute also works to recognize the University community engagement accomplishments at the institutional level. In addition to conducting surveys of University of Mississippi students and faculty to learn more about the University’s culture of service, the McLean Institute assists in applications to national distinctions. Each year since 2012 the University of Mississippi was named to the President’s Higher Education Community Service Honor Roll. The McLean Institute continues to assist with this and other applications.